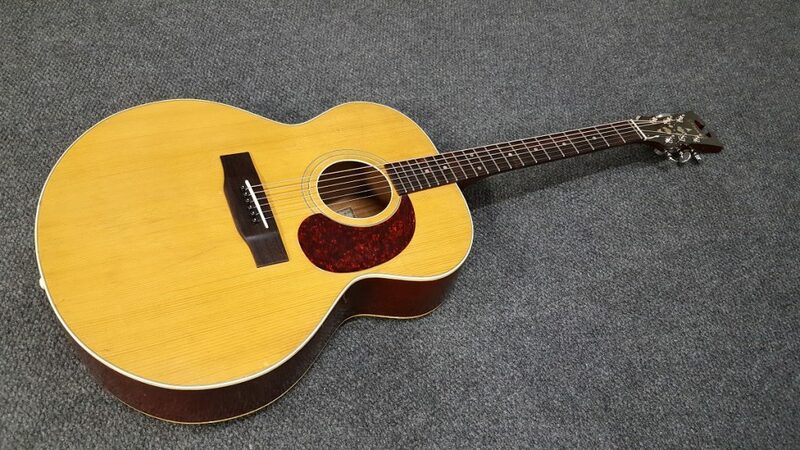 A really nice old Standel acoustic guitar came into my shop because it was not playing very well. 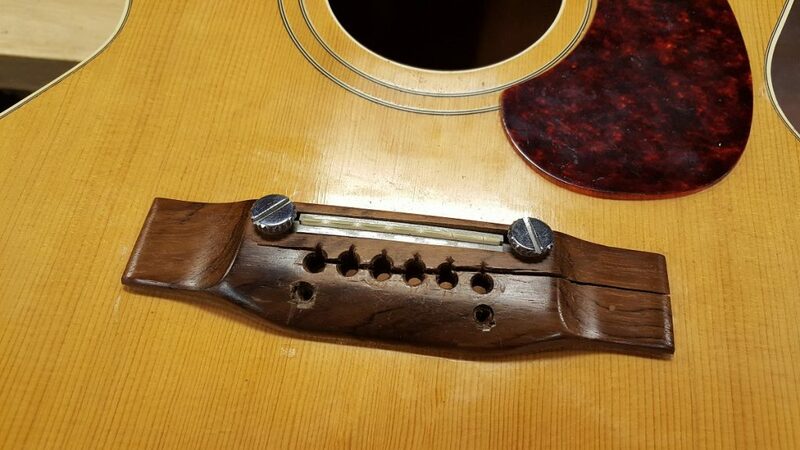 Upon closer inspection I found that almost every brace was loose, the frets were very worn and it obviously needed a new bridge because it was cracked right down the middle, plus it was also loose. It basically popped right off. The bridge is very large and ready made replacements were too small. I made a new bridge from a blank rosewood block. You have to get the size and height just right so it will play easily when glued to the top. While the loose braces were clamped and the glue drying I fabricated the new bridge. By the way you can only really glue one brace at a time because only so many clamps will fit in the sound hole. Another issue was the bridge plate was loose and the top was bowed. I made a slightly larger bridge plate to help flatten the top back to it’s normal shape. I used a thick piece of plexiglass to keep the top flat as well as acting like a caul for the bridge plate. Here is the new bridge I made next to the old one. 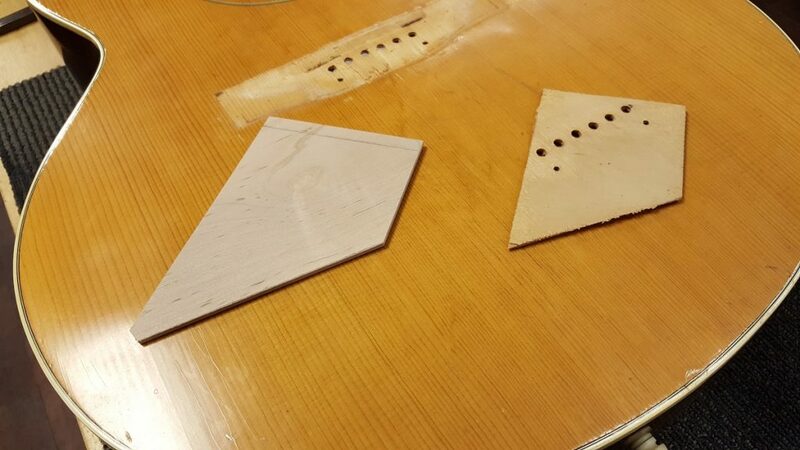 The new bridge will have a seated bone saddle which I believe will allow the guitar to have better tone and sustain. 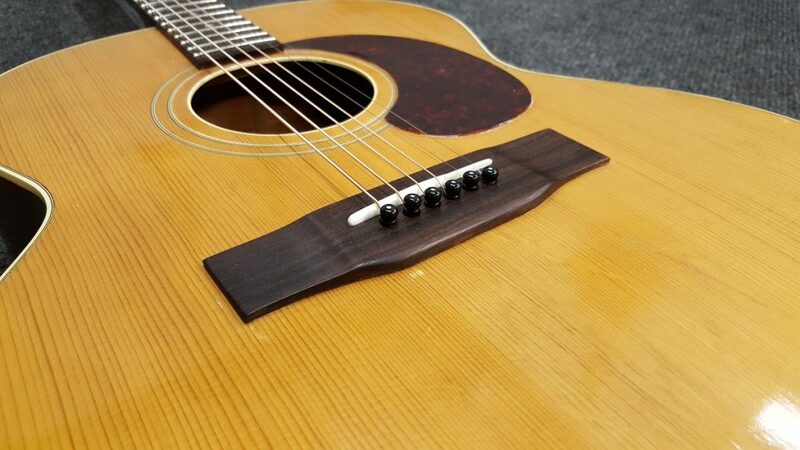 I find the adjustable saddles on acoustic guitars steal some tone and sustain. 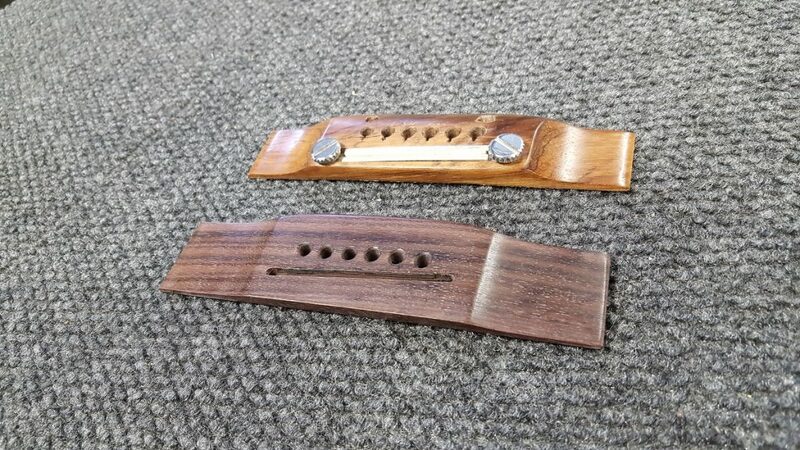 The color is different but the original bridge is Brazilian rosewood and it is not easy to get unless you have some stock. Apply some glue, clamp down the bridge and let it dry about 24 hours. Then it is safe to remove the clamps. 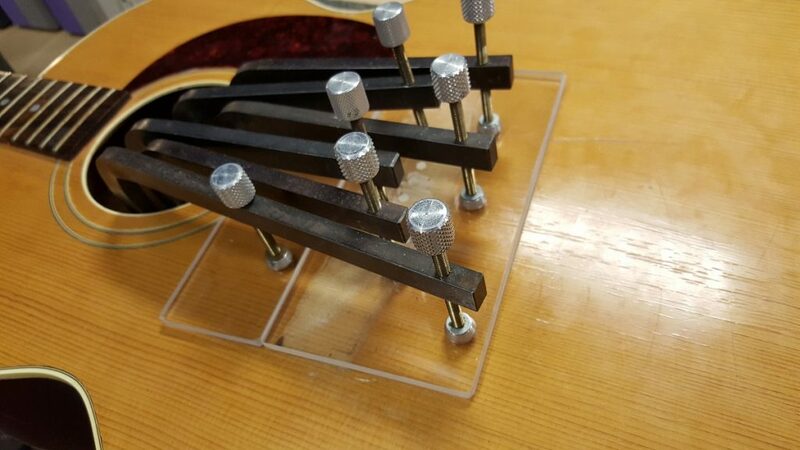 Now the bridge is solid, top is much flatter and the new position of the compensated bone saddle will allow for better intonation. My saddle location is much further from the fret board than the original and the intonation is pretty darn good. 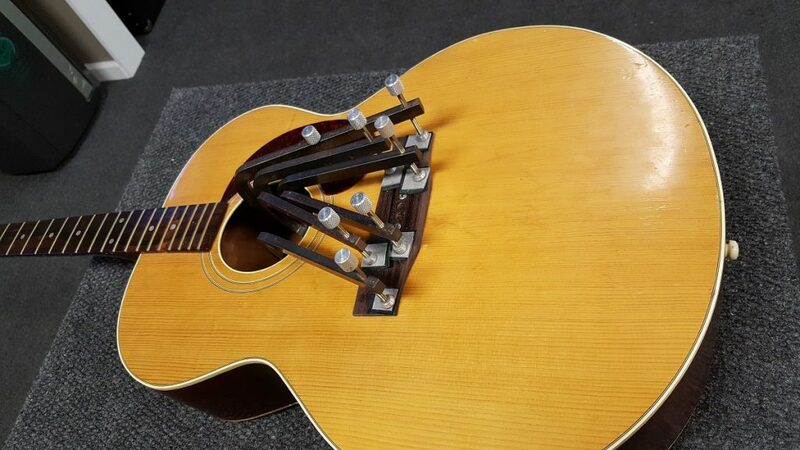 I don’t know how this guitar ever played in tune with the original saddle location. In the end it all worked out. This old Standel sounds warm & woody and plays like butter! The original frets were large and I used a very similar size nickel silver fret wire. The zero fret is stainless steel so it will not wear as the years go on. I’d say this guitar has a few more decades left in her now.